I am s-l-o-w-l-y getting my dining room done. Baby Steps! I need to be faster, because my family is coming over on Saturday night for my sister's birthday! And then Marcus's family will be here for lunch on Sunday. They might not love me anymore if it's not all finished and pretty. I painted this little table, which I showed you already, but I added some pizazz. A pink handle! Just what it always wanted! 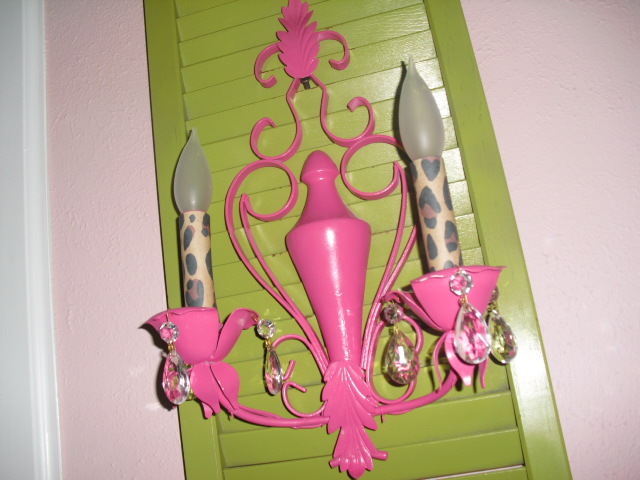 I painted the handle pink to go with my pink sconces. I was going to finish spray painting my dining room chairs today, but it got SUPER windy and dark outside. Could it possibly rain...here? I think I saw, literally, 5 drops fall from the sky. Well that all happened late in the afternoon right when we were about to reach 100 degrees. The clouds made us miss the mark. So we did not beat the record of 42 consecutive 100 degree days. We got stuck at 40 days! The bummer of it is, that all next week it's supposed to be 104 everyday. If we are not going to break the record, let's go ahead and start getting cool now! My sister in law, Lisa, found these cute shoes for Katie at a garage sale. They are the squeaker kind that I have always wanted for her. I think they are so cute. Now Katie needs to start walking on her own, so she can squeak all over the house! My friend Courtney thinks I can only last 10 minutes with the squeakers. I think that sounds like a challenge! Ohh the squeakers! I hate to say but I am glad those came along after my kids because I am a total goof when it comes to annoying noises. I just cannot do them! Oh my word...I was SO UPSET when we didn't reach the record! The way I see it...if it's going to be THIS HOT all summer we might as well break the record, right?! And if not...then the 100+ degree days should stop and fall should start NOW! HA! I love the nightstand, so cute! And what fun shoes, adorable! I love the pink handle! So creative!